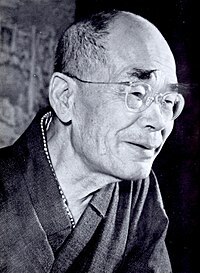 Suzuki's Zen master, Soyen Shaku, who also wrote a book published in the United States (English translation by Suzuki), had emphasized the Mahayana Buddhist roots of the Zen tradition. Suzuki's contrasting view was that, in its centuries of development in China, Zen (or Chan) had absorbed much from indigenous Chinese Taoism. Suzuki believed that the Far Eastern peoples were more sensitive, or attuned, to nature than either the people of Europe or those of Northern India. Suzuki subscribed to the idea that religions are each a sort of organism, which is (through time) subject to "irritation" and having a capacity to change or evolve. It was Suzuki's contention that a Zen satori (awakening) was the goal of the tradition's training, but that what distinguished the tradition as it developed through the centuries in China was a way of life radically different from that of Indian Buddhists. In India, the tradition of the mendicant (holy beggar, bhikku in Pali) prevailed, but in China social circumstances led to the development of a temple and training-center system in which the abbot and the monks all performed mundane tasks. These included food gardening or farming, carpentry, architecture, housekeeping, administration (or community direction), and the practice of folk medicine. Consequently, the enlightenment sought in Zen had to stand up well to the demands and potential frustrations of everyday life. Suzuki is often linked to the Kyoto School of philosophy, but he is not considered one of its official members. [original research?] Suzuki took an interest in other traditions besides Zen. His book Zen and Japanese Buddhism delved into the history and scope of interest of all the major Japanese Buddhist sects. That Suzuki was a university-educated intellectual steeped in knowledge of Western philosophy and literature allowed him to be particularly successful and persuasive in presenting his case to a Western audience. As Suzuki portrayed it, Zen Buddhism was a highly practical religion whose emphasis on direct experience made it particularly comparable to forms of mysticism that scholars such as William James had emphasized as the fountainhead of all religious sentiment. It is this idea of a common essence which made Suzuki's ideas recognizable to a Western audience, who could identify with the Western esotericism concealed in it, disguised as eastern metaphysics. Suzuki presents a version of Zen that can be described as detraditionalized and essentialized. This resemblance is not coincidental, since Suzuki was also influenced by Western esotericism, and even joined the Theosophical Society. forms of Buddhism that have emerged out of an engagement with the dominant cultural and intellectual forces of modernity." western monotheism; rationalism and scientific naturalism; and Romantic expressivism" as influences. The popular "lay" image of Zen, notably the notion that Zen refers not to a specific school of Buddhism but rather to a mystical or spiritual gnosis that transcends sectarian boundaries, is largely a twentieth-century construct. Beginning with the persecution of Buddhism in the early Meiji (haibutsu kishaku) Zen apologists have been forced to respond to secular and empiricist critiques of religion in general, and to Japanese nativist critiques of Buddhism as a "foreign funerary cult" in particular. In response, partisans of Zen drew upon Western philosophical and theological strategies in their attempt to adapt their faith to the modern age. Suzuki has been criticized for this essentialist approach. As early as 1951 Hu Shih, criticized Suzuki for presenting an idealist picture of Zen. In his discussion of humanity and nature, Suzuki takes Zen literature out of its social, ritual, and ethical contexts and reframes it in terms of a language of metaphysics derived from German Romantic idealism, English Romanticism, and American Transcendentalism. ... D. T. Suzuki, whose most cherished methodology seems to have been to describe some aspect of Zen as beyond ordinary explanation, then offer a suitably incomprehensible story or two by way of illustration. Obviously, Suzuki's approach captured the imaginations of generations of readers. However, while this approach substantiated Suzuki's authority as one with insider access to the profound truths of the tradition, another result was to increase the confusion in reader's minds. To question such accounts was to admit one did not "get it", to distance oneself even further from the goal of achieving what Suzuki termed the "Zen enlightenment experience". According to Sharf and Victoria, Suzuki was associated with Japanese nationalism and its propagation via the appraisal of Japanese Zen. He has been criticised for defending the Japanese war-efforts, though Suzuki's thoughts on these have also been placed in the context of western supremacy in the first half of the 20th century, and the reaction against this supremacy in Asian countries. "D. T. Suzuki left a record of his early view of the Nazi movement that was included in a series of articles published in the Japanese Buddhist newspaper, Chūgai Nippō, on October 3, 4, 6, 11, and 13, 1936." In this Suzuki expresses his agreement with Hitler's policies as explained to him by a relative living in Germany. "While they don't know much about politics, they have never enjoyed greater peace of mind than they have now. For this alone, they want to cheer Hitler on. This is what my relative told me. It is quite understandable, and I am in agreement with him." He also expresses agreement with Hitler's expulsion of the Jews from Germany. "Changing the topic to Hitler's expulsion of the Jews, it appears that in this, too, there are a lot of reasons for his actions. While it is a very cruel policy, when looked at from the point of view of the current and future happiness of the entire German people, it may be that, for a time, some sort of extreme action is necessary in order to preserve the nation." Suzuki expressed sympathy with individual Jews. "As regards individuals, this is truly a regrettable situation." Suzuki was a close friend of Gestapo officer Karlfried Graf von Dürckheim. Durkheim, also a noted expounder of Japanese Zen philosophy in the West, was a committed Nazi and had been a Gestapo officer in Tokyo during the war. He helped his friend Suzuki introduce Zen Buddhism to the West. Dürckheim was arrested during the Allied occupation of Japan and served more than a year in prison due to having been a member of the Gestapo. At the onset of modernization in the Meji period, in 1868, when Japan entered the international community, Buddhism was briefly persecuted in Japan as "a corrupt, decadent, anti-social, parasitic, and superstitious creed, inimical to Japan's need for scientific and technological advancement". The Japanese government intended to eradicate the tradition, which was seen as a foreign "other", incapable of fostering the nativist sentiments that would be vital for national, ideological cohesion. In addition to this, industrialization led to the breakdown of the parishioner system that had funded Buddhist monasteries for centuries. However, a group of modern Buddhist leaders emerged to argue for the Buddhist cause. These leaders stood in agreement with the government persecution of Buddhism, accepting the notion of a corrupt Buddhist institution in need of revitalization. As a response to the modernisation of Japan and the persecution of Buddhism, the shin bukkyo, or "New Buddhism" came into existence. It was led by university-educated intellectuals who had been exposed to a vast body of Western intellectual literature. Advocates of New Buddhism, like Suzuki's teachers Kosen and his successor Soyen Shaku, saw this movement as a defense of Buddhism against government persecution, and also saw it as a way to bring their nation into the modern world as a competitive cultural force. Suffice it to say that, just as the writings of Suzuki and Hisamatsu are not representative of traditional (i.e., pre-Meiji) Zen exegetics, the style of Zen training most familiar to Western Zen practitioners can be traced to relatively recent and sociologically marginal Japanese lay movements which have neither the sanction nor the respect of the modern Rinzai or Sōtō monastic orthodoxies. Indeed, the one feature shared by virtually all of the figures responsible for the Western interest in Zen is their relatively marginal status within the Japanese Zen establishment. While Suzuki, Nishida, and their intellectual heirs may have shaped the manner in which Westerners have come to think of Zen, the influence of these Japanese intellectuals on the established Zen sects in Japan has been negligible. At this point, it is necessary to affirm that Japanese Zen monasticism is indeed still alive, despite the shrill invectives of some expatriate Zen missionaries who insist that authentic Zen can no longer be found in Japan. The traditional form of Zen has been greatly altered by the Meiji restoration, but Japanese Zen still flourishes as a monastic tradition. The Zen tradition in Japan, in its customary form, required a great deal of time and discipline from monks that laity would have difficulty finding. Zen monks were often expected to have spent several years in intensive doctrinal study, memorizing sutras and poring over commentaries, before even entering the monastery to undergo kōan practice in sanzen with a Zen master. The fact that Suzuki himself was able to do so (as a layman) was largely the invention of New Buddhism. During the Meiji restoration the Nihonjinron philosophy took prevalence. It emphasizes the uniqueness of the Japanese people. This uniqueness has been attributed to many different factors. Suzuki attributed it to Zen. In his view, Zen embodies the ultimate essence of all philosophy and religion. He pictured Zen as a unique expression of Asian spirituality, which was considered to be superior to the western ways of thinking. The nihonjinron cultural exceptionalism polemic in Suzuki's work—the grotesque caricatures of 'East' versus 'West'—is no doubt the most egregiously inane manifestation of his nationalist leanings. One is led to suspect that Suzuki's lifelong effort to bring Buddhist enlightenment to the Occident had become inextricably bound to a studied contempt for the West. In cases where Suzuki directly expresses his position on the contemporary political situation—whether in his articles, public talks, or letters to friends (in which he would have had no reason to misrepresent his views)—he is clear and explicit in his distrust of and opposition to State Shinto, rightwing thought, and the other forces that were pushing Japan toward militarism and war, even as he expressed interest in decidedly non-rightist ideologies like socialism. In this Suzuki's standpoint was consistent from the late nineteenth century through to the postwar years. These materials reveal in Suzuki an intellectual independence, a healthy scepticism of political ideology and government propaganda, and a sound appreciation for human rights. Contemporaries of Suzuki acclaimed his works. Suzuki's works on Zen Buddhism are among the best contributions to the knowledge of living Buddhism. We cannot be sufficiently grateful to the author, first for the fact of his having brought Zen closer to Western understanding, and secondly for the manner in which he has achieved this task. But Jung was also critical, warning against an uncritical borrowing from Asian spirituality. ^ a b Fields 1992, pg. 138. ^ D.T. Suzuki The Training of the Zen Buddhist Monk. New York: University Books. 1965. ^ McRae 2001, p. 71-74. ^ Faure 1996, p. 89-99. ^ a b Victoria 2006. ^ Levenda, Peter (2014-11-08). The Hitler Legacy: The Nazi Cult in Diaspora: How it was Organized, How it was Funded, and Why it Remains a Threat to Global Security in the Age of Terrorism. Nicolas-Hays, Inc. ISBN 9780892545919. ^ Sharf 1993, p. 3. ^ a b Sharf 1993, p. 4. ^ Sharf 1993, p. 7. ^ Sato 2008, p. 118. ^ a b c Suzuki, D. T. (1978). Manual of Zen Buddhism. Random House. p. 11.